Fruit & Vegetable Gift Certificates | From gThankYou! Any Brand, Any Grocery Store. gThankYou! Fruits & Vegetables Gift Certificates are an appreciated employee gift! Good for any brands, and any preparations of fruits and vegetables. Redeem at virtually any US grocery store chain. What are Fruits & Vegetables Gift Certificates? gThankYou! Fruits & Vegetables Gift Certificates are good for any brands, variety or preparation of fruits and vegetables, including fresh, frozen, canned, even cooked. Recipients can redeem their fruit and vegetable vouchers at virtually any major U.S. grocery store chain. gThankYou Gift Certificates work as Manufacturer Coupons, just like cents-off coupons. Our Fruits & Vegetables Certificate is good for any combination of fruits and vegetables, and available in budget-friendly denominations from $5 to $20. Watch our two-minute video to the right and learn how gThankYou makes meaningful employee gift-giving easy, convenient and affordable — at the holidays or anytime! Give the gift of health! gThankYou! Fruits & Vegetables Gift Certificates are popular workplace wellness incentives and make great health-conscious gifts. It’s an easy and affordable way to promote workplace wellbeing. Reward for completing health programs — gThankYou! Fruits & Vegetables Gift Certificates are a budget-friendly reward that reinforces wellbeing goals and promotes sustainable workplace wellness. A healthy reward has an immediate, meaningful and positive impact on employees. Incentive to stay with a program — Be encouraging! Punishing employees for failing to meet health goals is discouraging and doesn’t entice them to try again. HR experts say the better tactic is to support goals with gifts that increase employee engagement, morale and satisfaction. Healthcare compliance incentive — Thank participants for completing your organization’s tobacco cessation class, health screening or other wellness initiative. Gratitude is essential for nurturing healthy living! Combine with gThankYou! 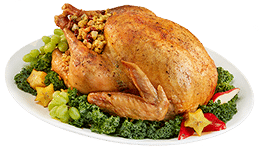 Turkey Gift Certificates or Turkey Or Ham Gift Certificates to provide the gift of a complete meal at the holidays or other special occasion. The meal we share with family at the holidays is a special time of bonding and gratitude. A voucher for fruits and vegetables is the perfect accompaniment to your company’s holiday well-wishing. Share alone as a valued holiday gift for vegetarian employees and their families. Let vegetarians know you care with a gift that everyone enjoys, but is especially valued by them. Not only is the gift of food practical and appreciated, it shows you care about employees and their families. Keep gThankYou! Fruits & Vegetables Gift Certificates on hand to distribute as on-the-spot recognition for excellent performance. How do I order Fruits & Vegetables Gift Certificates? Order online or call us at 888-484-1658. It’s easy and convenient! Virtually all orders ship the day they are received. Large company or many locations? Call us to learn about large volume discounts and custom ordering and fulfillment. What does a gThankYou! Fruits & Vegetables Gift Certificate look like? No gift, especially health incentives and other tokens of encouragement, is complete without a meaningful message of gratitude, so take advantage of gThankYou’s free gift Enclosure Cards to personally thank your recipients. All gThankYou Gift Certificates come with optional Enclosure Cards with room for your personal message and organization logo — always free! We offer dozens of Enclosure Card designs — including designs for celebrating health or anytime appreciation, Autumn & Thanksgiving, and Christmas & Winter Holidays. We offer more than Fruits & Vegetables Gift Certificates! Choose from a variety of our popular food Gift Certificates perfect for workplace holiday gifts, anytime appreciation, wellness incentives and customer promotions. You select the variety and value that best fits your objectives and budget!